Posted December 18, 2012 by Omi Prive & filed under Custom Collection, Omi Privé, One-of-a-Kind Collection, Signature Collection, Trends. Well, it may not always be anticipated to give five gold rings, but it is widely known that jewelry is one of the best gifts to give – and receive – for the holidays. For some, purchasing jewelry may seem a bit daunting. There is a certainty that many need before committing to an item so costly, and as personal, as jewelry. It can especially seem stressful when choosing a gift for a significant other, aiming to get a piece he/she will love and enjoy without any reservation, while making the best investment possible! It is also widely known and understood that the holiday season often brings a level of financial stress to surface in general. For many, holiday shopping, while thrilling and fun, definitely puts an unwanted dent in the checkbook. Consumers are marketed to by most brands that feature their products in “gift guides,” insisting that they offer gift items to fit any budget. It is no secret that jewelry is costly. Therefore, I am taking a different approach this holiday season. The great emphasis on the monetary costs of gift-giving rather takes away from the true intent of it – to give the recipient something meaningful that shows thought and care. Instead of focusing intensely on monetary costs, shift the focus of the holiday purchase to the personality of the recipient, and what style she most often caters to. I have compiled some favorite Omi Privé pieces into a handy chart to assist purchasers with their selections, dividing jewelry tastes into four style categories. For those with a very feminine flair – lean towards refined settings with lighter colored center stones. Pink Sapphire, pink tourmaline, and pink spinel may exude exquisite and delicate taste. For the individualist – seek pieces that feature more rare and unique stones set in distinctive designs. Alexandrite, a natural color-changing stone, is always a conversation starter! Green tsavorite, orange spessartite, and red spinel pop and stand out on any skin tone. For the wearer with a more classic style, focus on traditional stones in timeless settings. 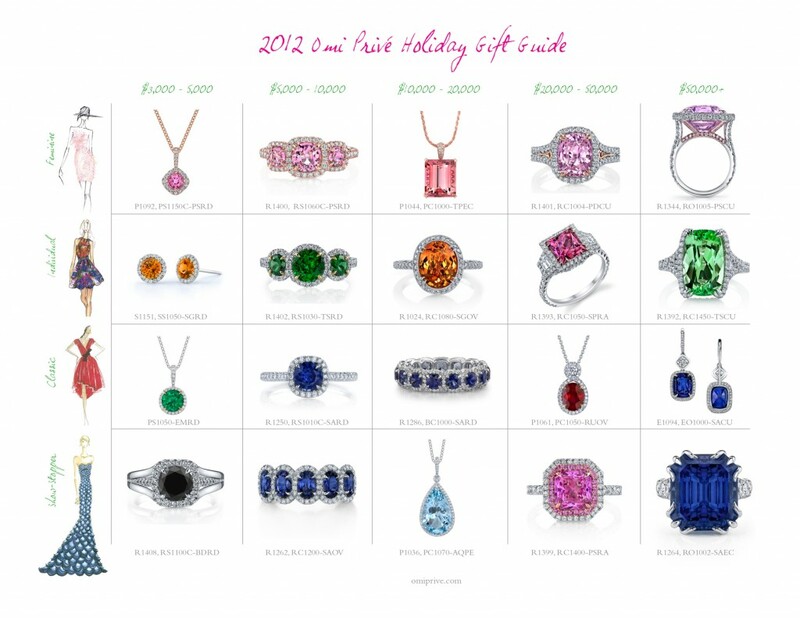 Ruby, emerald, and sapphire are the most well-known gemstones (and may also carry the most value). For the show-stopper, seek out one-of-a-kind designs that are not as commonly seen or available in the market. Obviously, many feel that the larger the item, the better, in this case. Most will agree that a knock-out piece does not always necessarily have to be enormous in size to catch the eye. Distinctive designs can often attract equivalent attention. Please feel free to peruse these pieces, and use my easy-to-read guide of how to give (and receive) Omi Privé color this season! 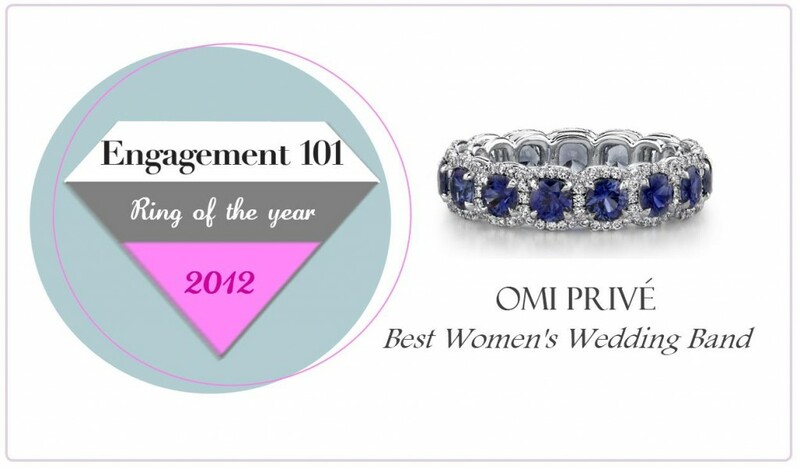 Omi Privé Wins Best Wedding Band for 2012 from Engagement 101 Magazine! Posted December 6, 2012 by Omi Prive & filed under As-Seen-In, Award Winning, Custom Collection, Facebook, Omi Privé, Sapphire. Post by Engagement 101 Magazine. Posted by Omi Prive & filed under Award Winning, Custom Collection, Omi Privé, Sapphire. Engagement 101’s second annual Bridal Jewelry Awards began with hundreds of submissions from distinguished jewelry designers from around the world, including Omi Privé. After a rigorous nomination process that whittled the submissions to just 48, the selections were then divided into eight categories of popular ring trends, including “Best Woman’s Wedding Band”. Omi Privé was delighted to be selected and presented among five other prestigious designers in the category. Through the month of November, thousands of men and women visited YourEngagement101.com to cast their vote for their favorite “ring of the year”. We are highly honored to have our Sapphire and Diamond eternity wedding band voted the “Women’s Wedding Band” of the year for 2012! Thank you everyone for your votes! This gorgeous sapphire and diamond platinum eternity wedding band has a total of 3.51 carats of diamond cut sapphires and 0.58 carats of French Pavé set brilliant diamonds.